Because I’m running out of time until it’s the end of the year and I really want to finish my Blindspot series before 2017 happens, here is a selection of my thoughts on The Sacrifice. I’m generally a Tarkovsky fan – I’ve enjoyed the vast majority of his films that I’ve seen thus far. 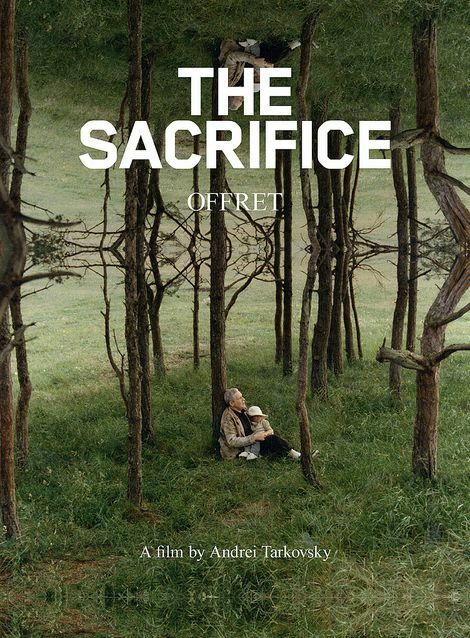 However, and I hate to say this because it was Tarkovsky’s final film before he passed away, The Sacrifice doesn’t rate as highly as the others for me. However, it is still enjoyable on a certain level. I would recommend watching this if (and only if) you have the mental stamina to stay awake, pay attention, and watch it closely. Because then, and probably only then, will you be able to fully experience and enjoy this film. Compared with Tarkovsky’s other works, The Sacrifice is slower, more methodical in the exploration of its story, perhaps even more contemplative. Tarkovsky enjoys a slow pace in his films, to be sure. But this one feels even slower. That’s not exactly a bad thing though, if you’re willing to keep your eyes on it and pay attention. But if you feel yourself going to sleep – just go to bed and start again in the morning. In typical Tarkovsky style, we have his characteristic use of both colour and sepia tones to illustrate the difference in both physical and emotional atmosphere, pre- and post-nuclear war. I love the way Tarkovsky works with colour because he makes you notice its presence or absence. My other favourite thing about Tarkovsky’s films is that just when you think everything is relatively ‘normal’, something magical happens. There’s usually some kind of naturally magical twist or flourish at the end of his films, and The Sacrifice is no different. The surprise in this one is great, and the ending is quite emotionally affecting in comparison to the rest of the film. But you really have to put in the hard yards to get there. The Sacrifice plays host to some excellent performances. 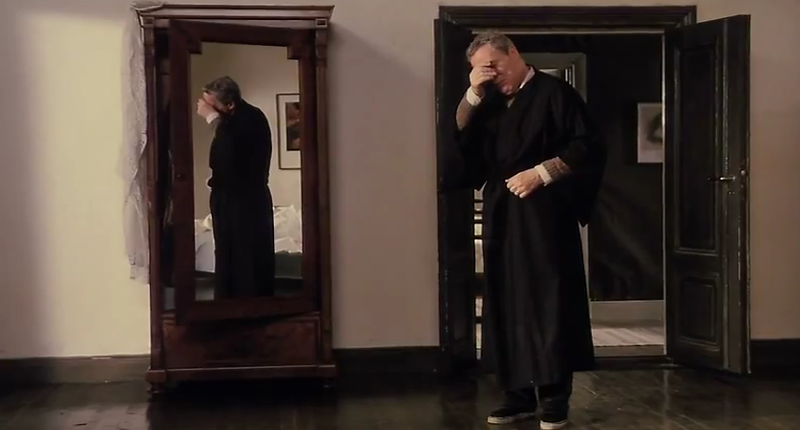 Erland Josephson is wonderful as Alexander, a tireless thinker who’s getting tired of thinking. But it was Susan Fleetwood’s performance as his wife, Adelaide, which really caught my eye. She is a powerful, angry force of nature, and her hysterics are a sight to see. The film not only explores man’s changing relationship with God in the face of disaster, but it also explores the different ways a family unit might respond to it; some might become aggressive, some might shut down, and some (in the case of Alexander) might resort to begging or bargaining. It’s interesting to see these relationships play out on screen between the different characters, but it cannot be denied that Alexander is arguably the most interesting character, and you look forward to seeing him the most considering that he contributes to most of the advancement of the story. For fans of Ingmar Bergman, The Sacrifice might seem a bit familiar. Tarkovsky worked with cinematographer Sven Nykvist on this one, who was a long-time collaborator of Bergman’s, and shot this film in a location that also looks very familiar to a seasoned Bergman viewer. In particular, The Sacrifice reminds me a lot of Bergman’s Shame (1968). A similar story, told in a similar manner, with very similar direction and cinematography. We also see a bit of Bergman’s The Seventh Seal (1957) coming out, in the form of a man bargaining with God/Death to avoid the inevitable. The Sacrifice is strange and haunting, and although it might not be Tarkovsky’s best film, it’s certainly worth a watch if you’re willing to put in the hard work. Watch the trailer here (unfortunately, it’s in French!). This was the final post for my Blindspot series for 2016! See the rest of my Blindspot films here. Hi Anna, interesting review yo. The film sounds like an interesting watch, though the timing and story I’m not sure would be for me. Thanks Curtis! Tarkovsky definitely isn’t for everyone. He always has great concepts but his delivery can be a bit too sluggish for some!